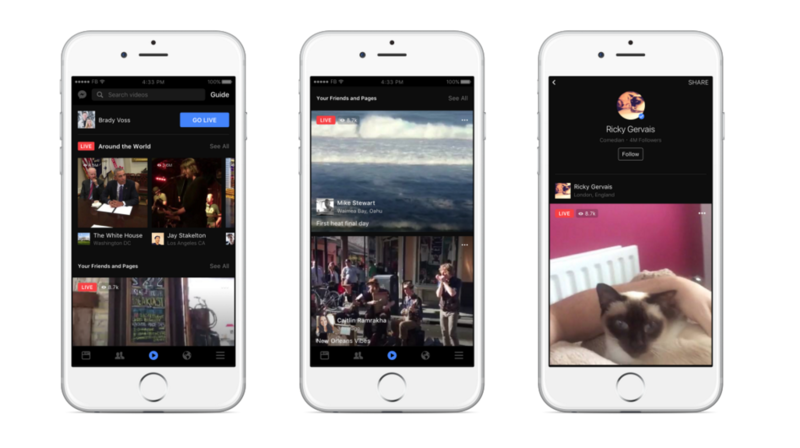 Facebook announced new features for Facebook Live to give users more ways to discover, share, and interact with live video, as well as more ways to personalize live broadcasts. The first new feature is Live for Groups and Events, which is designed to make it easier to share live video with certain people. With this, you can broadcast live video to a specific group or event. Similar to Periscope, Facebook is also adding Live Reactions, which let you express reactions (love, haha, wow, sad, or angry) in real time during a live video broadcast. These will animate on top of the video. They’re also adding a Replay Comments feature. Users will also have access to five filters that can be used to personalize live broadcasts. Soon, you’ll also be able to draw or doodle on your live video while live. In the discovery department, there’s a new Invite Friends feature as well as a Live Video Destination and a Live Map. To invite friends to watch a live video, you can tap on the Invite icon to the right of a live video and they’ll get a notification. The live video destination is a place to find live videos the world is talking about, live video from friends and creators you care about, and live video on topics you’re interested in. There’s also a search function. The Live Map gives you a visual way to look at public live broadcasts that are currently happening in over 60 countries. This is rolling out gradually on desktop. The other features will be rolling out on iOS and Android over the coming weeks. Facebook discusses all of this more here.